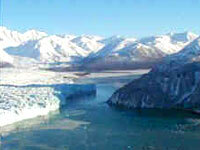 There is surely no more spectacular experience on the planet than to witness the calving of a titanic glacier. A stopover to watch nature's incredible marvel, the Hubbard Glacier, in action as the high wall of ice thickens and advances towards the Gulf of Alaska is one of the unforgettable moments that makes thousands of holidaymakers opt for an Alaskan cruise every year. The Hubbard Glacier is the largest tidewater glacier in North America, beginning its 75-mile (121km) journey to the sea on the tallest mountain in Canada, Mount Logan, and finally shedding tons of its bulk in awesome ice falls across the six-mile (10km) wide head of Yakutat Bay. Every day cruise liners pull in, their passengers bundled up in their warmest clothing and festooned with cameras and binoculars, as they hang over the deck rails to witness the stunning sight of the luminous blue-green ice wall as it creeps inexorably forward. Those who visit at the right time could be fortunate enough to see one of nature's most awesome events, when a chunk of ice cracks and falls thunderously from the wall into the ocean as the mighty glacier calves, startling the seals basking on ice floes. In contrast to what one would expect with many glaciers shrinking due to global warming, the Hubbard is growing and advancing, controlled apparently more by mechanics than climate. It is predicted that if the Hubbard Glacier continues to advance it will close the entrance of Russell Fjord and create the largest glacier lake in North America. Many cruise ships snare a chunk of ice so that their passengers can end the memorable day by getting up close and personal with the Hubbard Glacier, and enjoy a chunk of this special ice in their evening cocktail.